Love the bell shaped flowers on this plant. They look very delicate as they bloom. Bell Wort Plant, also known as wild oats and merry bells, is a delicate perennial wildflower found across much of the eastern United States. This dainty little native plant makes a perfect addition to the edging of any lawn or to add color to your ground coverage. Not only are they a lovely addition to the garden but this woodland native is known for its medicinal properties for throat ailments. Bellwort is easy to spot during a walk in the woods. Starting in mid-March, the plant can be identified by its dark green oval leaves that grow in pairs. The leaves are marked by perforated veins downs the length of the blade stretching out from the central seam down the middle of the sheet. Bell Wort Plant flower grows in clumps with multiple stems. The flower starts to blooms in late April with the appearance of several small, dropping, dark, yellow flowers. The blossom is made up of 6 narrow, twisted petals that give the herb its distinctive look. The flower develops an edible seed pod that looks like an inverted pyramid sectioned into three cells containing several seeds. This wildflower can be obtained at many nurseries and grows well in the shade in all temperate climates. Dig up an existing plant in late February, or early March and separate the roots for replanting. The plant will naturally spread itself. 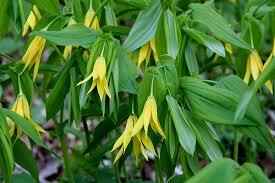 Bellwort is part of the Colchicaceae family, and it is native to North America. Bellowort typically grows around shaded slopes, river banks, and deciduous woodlands.